Consolidation is similar to refinancing a loan. You can consolidate all, just some, or even just one of your student loans. Direct consolidation loans are now the only type of federal student consolidation loan. Under the Direct Loan Consolidation Program, you can consolidate just about any type of federal student loan into a new Direct consolidation loan. Loans that are not eligible for consolidation include state or private loans that are not federally guaranteed. You are also ineligible to consolidate if your loans have been reduced to judgment (unless you vacate the judgment) or if there is a wage garnishment order against you. Interest rates for consolidation loans are fixed. The fixed rate is based on the weighted average of the interest rates on the loan at the time of consolidation, rounded up to the nearest one-eighth of a percentage point. The interest rate must not exceed 8.25% for consolidation loans prior to July 2013. Consolidation loan borrowers should not be charged origination fees. This section has information if you are current on your loans or if you want to consolidate to get out of default. Consolidation to get out of default works well for many borrowers with defaulted loans. After obtaining a consolidation loan, you get a fresh start, becoming eligible for new loans, grants, and even deferments. You will no longer be listed as currently in default on your credit records, and no longer subject to tax intercepts, garnishments, or other collection efforts. Once you are out of default, you can also choose one of the income-driven repayment plans. Whether you are current on your loans or in default, you should consider the pros and cons of consolidation before starting the process. Among other potential down sides, you may lose important rights by consolidating. If you still want to consolidate, you don’t have to include all of your eligible loans. The Department gives this example: If you have both Direct Loans and other types of federal student loans, and you have been making payments toward public service loan forgiveness on your Direct Loans, you should not consolidate your Direct Loans along with your other loans. Leaving out your Direct Loans will preserve the benefits on those loans. WARNING: It is very dangerous to consolidate federal loans into a private consolidation loan. This is because you will lose your rights under the federal loan programs once you choose to consolidate with a private lender. 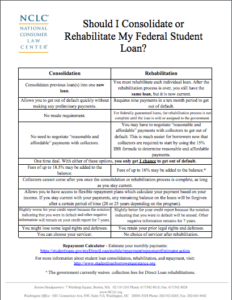 These include deferment, forbearance, cancellation, and affordable repayment rights. Direct Consolidation allows defaulted borrowers to make three consecutive reasonable and affordable monthly payments or agree to pay under Income Driven Repayment. An interruption in this consecutive period is allowed for qualifying military service members or affected civilians. These borrowers may resume their payments after their service is completed. See the programs for military section of this site for information about other options for military service members and certain civilians affected by war or national emergencies. Parent PLUS borrowers who also have other federal student loans and choose to consolidate with Direct will find that the PLUS loan taints the entire consolidation loan and will mean that they will not be eligible to repay the consolidation loan using IBR. If they wish to consolidate, parent PLUS borrowers may exclude the PLUS loans from the consolidation and pay them separately. These borrowers should also be able to consolidate and choose ICR. Despite what a collector may tell you, if you select income driven repayment, you do not have to make three payments before applying for consolidation. In most cases when you are consolidating out of default, the lender will add collection costs to the new loan balance. This should be no more than 18.5% of the outstanding principal and interest. The Department has said it routinely charges a lower percentage. You do not have to pay a fee or pay someone to help you get a government consolidation loan. Be wary of companies charging a lot of money for a free government program. The Department of Education warns borrowers to make sure they know which companies are legitimate. YOU NEVER HAVE TO PAY FOR HELP WITH YOUR STUDENT LOANS. The Department generally requires all borrowers to apply for Direct Loan consolidation using the studentloans.gov web site. (Click espanol to find a Spanish version of the on-line application). You can also download the paper application and mail it to the Department. 1. Choose loans and servicer. (You must select a servicer. You are required to select from the choices listed by the Department of Education). If may make this choice on-line or if you are sending in a paper application, you should send directly to the servicer you choose. It is hard to know which servicer to choose. The Department provides some general information about servicer performance in the on-line data center and quarterly performance reports. Before the Department will complete the process, they will send you a summary sheet that lists the loans that will be included in the consolidation. It will also list the repayment plan that you selected. You should review this information carefully and contact the Department if there are any problems. If you do not contact them within 15 days, they will assume the information is correct and will process the consolidation. (You should check the letter you receive to make sure that the time period has not changed). You must contact the Department during this period if you want to discontinue the consolidation or if you have questions. While they are collecting the information needed to make the monthly payment calculation, the Department may ask you to pay an initial amount that covers the monthly interest. If you cannot afford this payment, you may request a forbearance that will last until you are notified of your actual payment. To ask questions about consolidating your loans before you apply for a Direct Consolidation Loan,contact the Student Loan Support Center at 1-800-557-7394 . The Support Center can also help if you are having problems logging in or with you FSA Id. If you already have a consolidation loan with either FFEL or Direct, you are not allowed to “reconsolidate’, except in limited circumstances. Military service members are also allowed to re-consolidate to take advantage of the limits on interest accrual for Direct Loans. All is not lost if these exceptions don’t apply to you. You can look into getting out of default by rehabilitating your loan.